I criticize and make fun of the hysterical emails I get from liberal groups, so it seems only fair that I should criticize and make fun of the hysterical emails I get from conservatives. I actually have less patience with idiocy from conservatives since they ought to know better. I expect conservatives to be at least somewhat more rational and sensible than liberals, though we do have our idiots on our team. Anyway, here is an email I recently received. Our country is in trouble. We need you. President Obama and the politicians and bureaucrats in Washington care more about power, wealth and their own selfish desires than they do about our country and its citizens. The Washington Establishment has created the worst recession since the Great Depression … cut $700 Billion from Medicare under Obamacare … destroyed our privacy rights by spying on every phone call, email and fax communication … endangered our Constitutional rights under the First, Second, Fourth, and other amendments…and much more. They’ve even threatened to nationalize whole industries by Executive Order alone. And there’s something else. On Friday, March 16, 2012 America ceased being a Republic and became a dictatorship in one swipe of a pen. That dark day Obama committed the boldest assault on America since the Revolutionary War—while Americans weren’t looking. Barack Hussein Obama quietly gave himself the power to impose Martial Law, bypassing both the Constitution and Congress through Executive Order. Executive Order No. 13603—Obama’s National Defense Resources Preparedness Executive Order—gives Barack Hussein Obama unprecedented power to bring about socialism in America and create a regime so powerful, so vile, it is Soviet-like in nature. Martial Law can and will happen whenever he chooses. It may happen one fateful night while we sleep—he can manufacture a crisis to make it happen. And when it does, we will find ourselves waking up to a complete police state and news that Obama has declared himself supreme dictator over all the land. This is very serious my fellow Patriot. How can we stop this power grab destined to tear the heart out of America, leaving us with little but the clothes on our backs? For starters, I’m writing to urge you to donate today so we can DERAIL OBAMA’S EXECUTIVE ORDER TO IMPLEMENT MARTIAL LAW! As a full-fledged, active member of the Tea Party I fully support this movement. Please, there’s no time to wait. 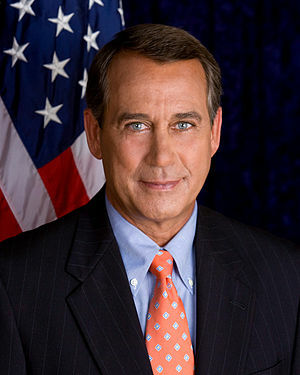 Please make a contribution to the Tea Party in support of their efforts to fight government tyranny. The Tea Party represents the best, perhaps the only, hope for our nation. We have to stand up and fight this shocking power grab. If we do not, we’re destined for Martial Law. This Executive Order allows Obama to hijack our country, run roughshod over Congress and stick it to Patriots. It’s a frightening abuse of power that must be stopped—that’s why we need you to support the Tea Party with a donation without delay. It goes on and on but is basically a plea for money, with dire consequences if Obama is allowed to get away with his nefarious plan. The only really important part of this message is the reference to Executive Order 13603, which apparently allows President Obama to declare martial law and suspend the constitution. This is a violent assault on our personal liberty, privacy rights and the rule-of-law. I’d like to give you a few examples of what this means to you, to me, our children, grandchildren and loved ones. There’s so much more, too. Don’t you see? This is Obama’s communist utopia—the dreams of his father. Those dreams were meant to kill capitalism, create a society of “fair share” and income equality no matter whether or not you are deserving of it or whether you earned it. Patriots, this is oppression at its worst. Sounds serious, doesn’t it? Is any of it true? Well, there really is an Executive Order 13603 and the language of the order might lend itself to the interpretation above, but this isn’t something that Barack Obama came up with. According to snopes.com, this executive order is nothing more than an update of similar orders issued by President Clinton, which was an update of previous such orders. 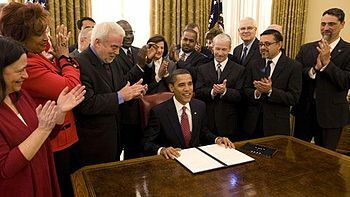 On 16 March 2012, President Barack Obama issued an executive order (EO) covering National Defense Resources Preparedness, prompting Congresswoman Kay Granger to pen the (since-removed) missive quoted above. Despite claims that the executive order provided the President with unprecedented new powers such as declaring martial law, seizing private property, implementing the rationing of food, gasoline, and drugs, restarting peacetime conscription, and nationalizing America industry, merely by declaring a national emergency, the National Defense Resources Preparedness EO issued by President Obama was simply a minor updating of a similar order issued by President Bill Clinton in 1994 (which itself had decades-old predecessors) and amended several times since. If you think that snopes.com has a liberal bias, they cite a post from the conservative blog hotair.com. We’re getting a lot of e-mail this weekend about an executive order issued on Friday afternoon by President Obama titled “National Defense Resources Preparedness.” While the timing of the EO is curious — why send it out on a Friday afternoon when an administration is usually trying to sneak bad news past the media? — the general impact of it is negligible. This EO simply updates another EO (12919) that had been in place since June 1994, and amended several times since. Barack Obama may be arrogant, and the timing of this release might have looked a little strange, but this is really nothing to worry about at all. So basically, this is nothing more than a routine update of a policy that was put into place at the beginning of the Cold War to ensure that the government could still function if the Russians nuked us. And, if you look at the date of the posts at snopes and hot air, you will notice that this particular rumor has been going around since 2012. If President Obama is really planning to make himself a dictator, he is taking his time about it. Frantic messages about martial law like this one only distract from the real dangers to our freedom. I don’t think the danger to our liberties is that President Barack Obama is going to announce that he is a dictator tomorrow morning. It is the precedents he is setting that worry me, this steady increase of the power of the presidency and the federal bureaucracy at the expense of our elected representatives. President Obama didn’t begin this process. It has been a bipartisan effort. Even our history books are part of it. Have you ever noticed that it is the presidents who increased the powers of their office that get the most praise from historians, whether the circumstances warranted extraordinary action or not. Presidents who minded their own business and let the country run itself are forgotten or derided as do-nothings. What I fear, is that this process will continue until eventually we end up with something like an elected dictator, a Caesar ruling over us. A ruler who governs arbitrarily and is himself above any law or restraint. This is the real danger, and being one that grows very gradually, over the decades, and is reinforced by the natural human desire to look to a Leader, is one that is a lot more difficult to fight against than the fantasies of martial law invoked by this email. Barack Hussein Obama Is the Last American President (thecommonsenseshow.com) Good grief people, calm down!! Organizing for Action wants to give me a free bumper sticker. 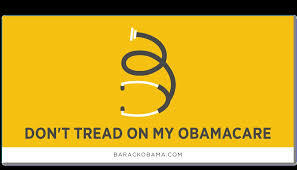 This is a parody of the Gadsden flag often seen at Tea Party rallies. 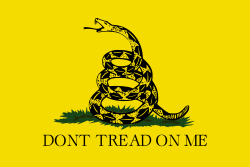 The Gadsden flag dates from the Revolutionary War. It was designed by Christopher Gadsden in 1775 and was one of the first flags used by Americans until the Stars and Stripes. Benjamin Franklin explained the significance of using a rattlesnake as a symbol for the American spirit. It makes a lot more sense than his proposal that the new nation’s national bird be the turkey. Notice the difference in significance of the two symbols. The one, the Gadsden Flag, shows nothing more than a desire to be left alone, with the implied threat to those that meddle. 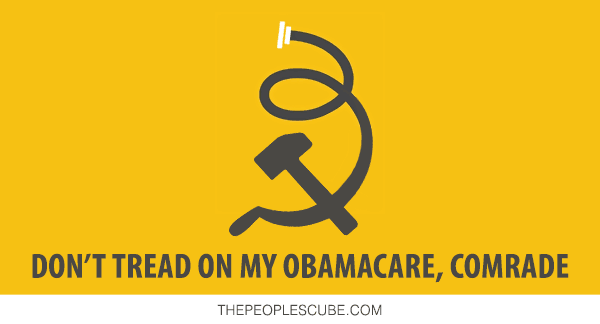 The other, the Obamacare Sticker shows a desire for services paid for by other people. Has the American character really degenerated so far? Perhaps this image from the People’s Cube might work better. I was reading this column by Rush Limbaugh‘s younger (and smarter) brother David Limbaugh at Townhall.com and a couple of things stuck me. First of all is the unpresidential spectacle of Obama blaming Rush for his inability to get his legislation passed. number and daily shares it with his vast audience. 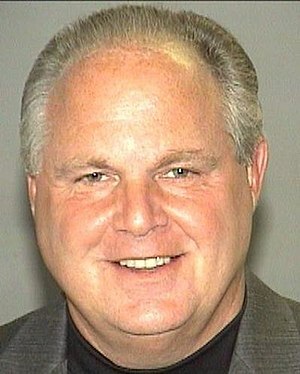 Despite the fact that Rush Limbaugh has a large platform with which to present his views, he is still only a private citizen. He has no power to enact or block legislation and it is beneath the dignity of any president to personally attack a private citizen. This sort of thing only makes Obama look petty and probably helps Limbaugh maintain his ratings. The second thing that struck me was this remark by Obama. I seriously doubt that any such conversations took place between Republican congressmen and Obama, but if they did, it shows the type of Republican who would befriend Obama — the type who is dishonest with his constituency. I wouldn’t doubt that many such conversations have occurred. But the point is that isn’t this how democracy is supposed to work? These people in Congress are supposed to be representing their constituents. 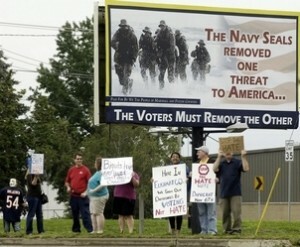 If their constituents are opposed to Obama’s agenda, then shouldn’t they be representing such opposition? One gets the idea that President Obama would rather rule by decree with a rubber stamp Congress giving some fiction of constitutionality. Probably all presidents have felt that way from time to time, but Obama seems less able to conceal it. One of the greatest frustration that conservatives have had is politicians who talk conservative while campaigning but then vote liberal as soon as they get to Washington. Until recently these spineless wonders have been more afraid of the New York Times saying something bad about them than the reaction of the people back home. If fear of the Tea Party has caused these people to actually start expressing the will of the people they actually represent, than the Tea Party has been a very good thing for this country.